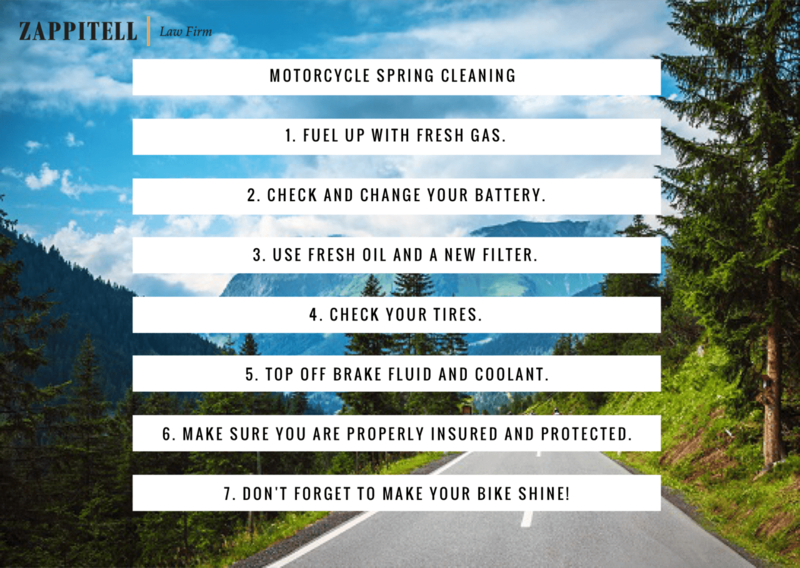 While you may see no problem with using gasoline that his been left in the tank all winter long, stale gasoline can be extremely problematic for your bike. It is always best to start the season with completely fresh fuel. Why take a chance with gasoline that has spent all winter deteriorating? During those few months, the chemical components in gasoline will have started to evaporate and once mixed with oxygen, will become even more problematic. This simple step can save you months of annoying and expensive issues. Much like gasoline, an old battery that has been sitting in your bike for months without running, can pose a significant problem for you. Just like automobiles, battery maintenance is key. Whether you have upgraded to a lithium battery or not, in only takes a few instances of draining the battery for it to no longer work or for the bike to stall out while you are out on ride. If you have not maintained your battery over the winter, or there seems to be some issues with the battery holding a charge, change the battery completely. You might also want to consider investing in a trickle charger, to maintain a small charge on your battery year round. It is key to change the oil and the filter for your motorcycle after months of it sitting dormant. 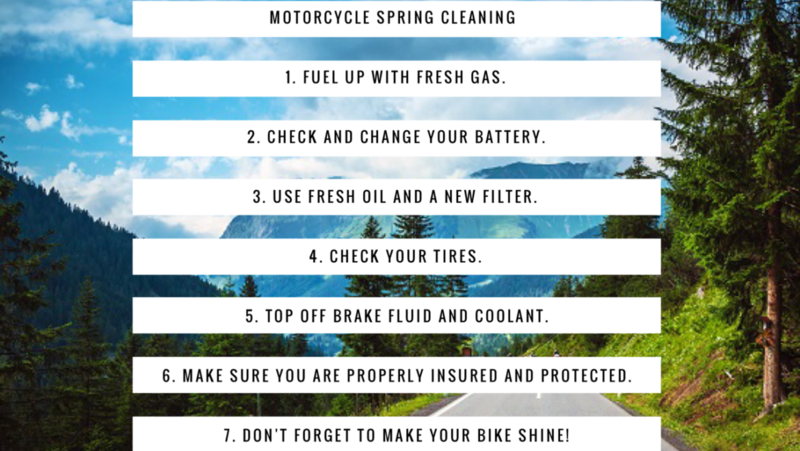 Even if you changed the oil during the winter, or are using synthetic oil that does not break down as significantly, it is better to be safe and start off riding season with fresh oil and a clean filter. Checking your tires for punctures, cracks, stress marks, or flat patches from storage may already be a part of your regular motorcycle maintenance, however it is even more important after months of sitting idle. Ensuring your tires are in tip top shape and maintaining proper air pressure should be an important step in your bike safety routine. For an easy and enjoyable riding season, get all of the maintenance chores out of the way at once. This should include topping off all necessary fluids. Brake Fluid, often neglected, should at the very least be topped off. 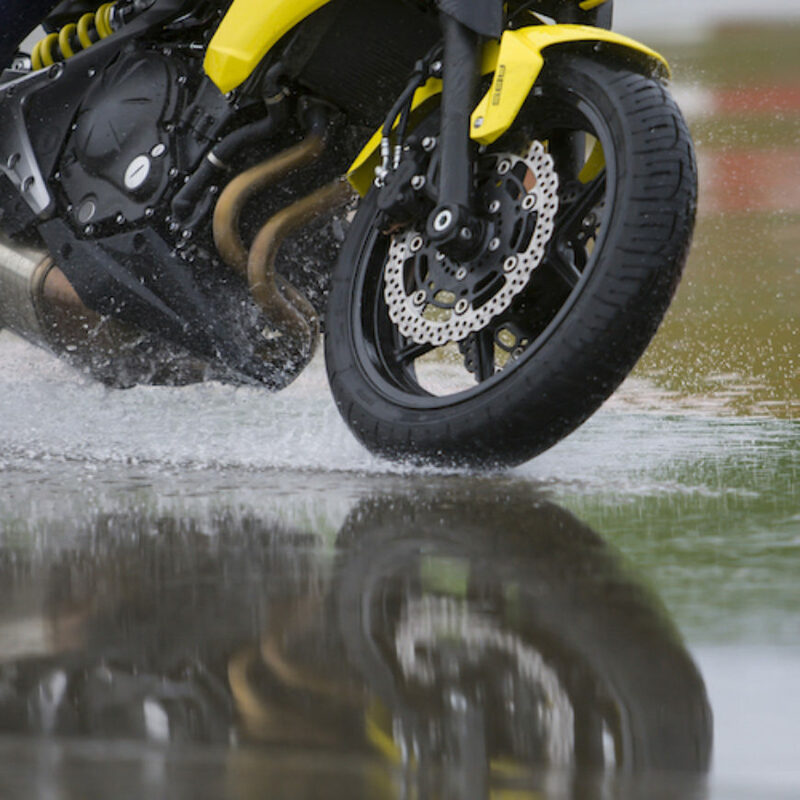 However, for an optimal ride, you would want to do a full flush of your brake system and start with fresh fluid. It is always a good idea to double-check your insurance coverage. Minimum liability insurance is required by most states for motorcycles, however you may want to consider optional coverage for collision, emergency road coverage, and additional medical coverage. After working so hard to make sure your bike is ready for spring, make sure it looks as good as it rides. A good wash and wax will prevent cosmetic damage as well as ensure a relaxing and well-deserved start to riding season.